I love that Korean food has become so popular and it is, in fact, the type of food that most of my friends ask me to make for them when I have people over. Here in Madison, we don’t have a lot of Korean restaurants, but we do have a couple Korean markets so I’m able to get what I need and cook Korean food at home! I spend most of my time in my kitchen. It’s where I cook, where my family gathers for meals, where my husband and I sit and talk as he flips through the mail after coming home from work, and this is where I entertain. We actually don’t have a formal dining room in our house, just a large breakfast nook type space and the large island in my kitchen, so this area has become my main place to entertain. When you’re having guests over, stow away some of those extra appliances. I make sure that everything is put away because I like to have my kitchen countertops as clean and open as possible. 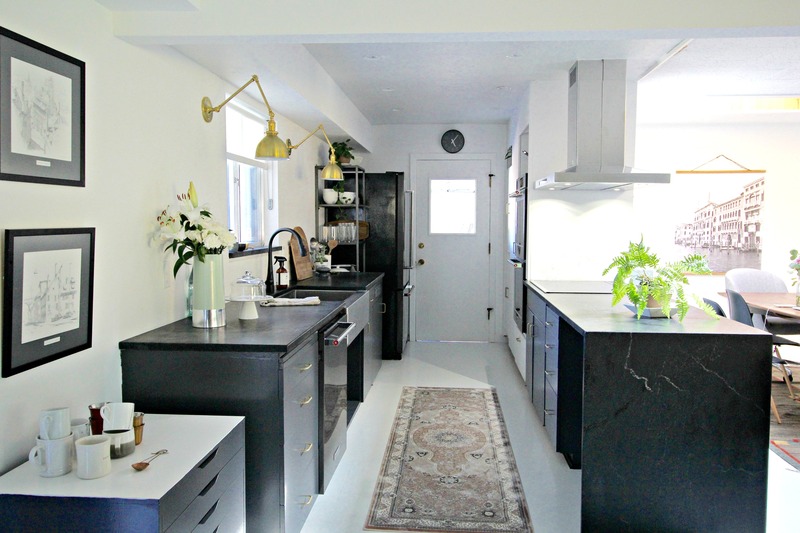 Clean surfaces are more inviting and mean more room for food and drinks, and that’s always a good thing! Once things are de-cluttered and cleared out, you’re halfway there. Don’t be afraid to break out the good plates. Yes, use the real ones. I don’t mind using paper or plastic plates for the kids, especially when there are a lot of them there for a party, but I absolutely encourage you to use plates for your grown-up guests. All of the dishes can go into the dishwasher afterwards anyway. Don’t worry if you don’t have enough matching dinnerware. Using plates and dishes that are all in the same color family works just fine, too. I’m all about the extras as well. I love a pretty setup with lots of fresh flowers and name cards for some of the appetizers if needed. Take the time to pick out the perfect flowers, thinking of the colors, and again, use the nice vase. I’m no Martha Stewart but I think choosing the right vase and trimming your flowers to the right size makes all the difference. When I arrange my food platters and drink service, I always have everything out and setup before our guests arrive. The serving utensils are out next to the platters, and glasses are available next to the drinks. 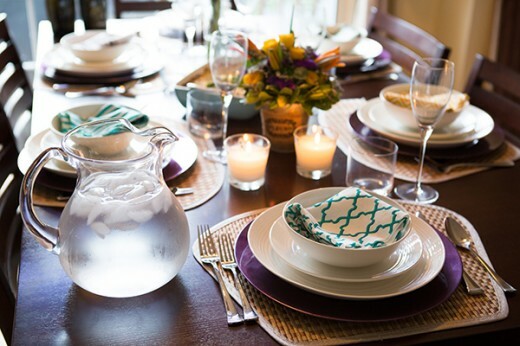 When your guests arrive, you just want to relax and enjoy yourself too, and last minute scrambling for serving pieces and the right glasses will eat up time and create stress. Arrange everything in a way that will make it easy for your friends to get food and pour themselves a drink. You’ve already done all the prep work, so you might as well make it easy for them to help themselves when they get there. When entertaining, I like to focus on feeding my guests delicious food and making them feel at home. I plan ahead, create my menu and get all of my dishes ready. And whether you’re cooking yourself, having friends bring dishes, or ordering food, think about the serving size, number of people, food allergies and incorporating variety. When possible, I also like to have a theme for my food. So, one night may be Korean food night, and the next time I entertain it might be Italian food. This makes it easier because it keeps you focused when planning the menu. I love to cook, so I will always prepare a few dishes on my own. My rule is to keep it simple and delicious. If you’re planning to cook more elaborate dishes, plan accordingly. Set an order in which you plan to cook them. Make sure you know when things are going into the oven, in what order and for how long. If the party is more casual, I like to serve a lot of finger foods and appetizers. Korean Kimchi Scallion Pancakes, or Kimchi Pajeon, are one of my favorite things to make because they are so easy and delicious. They’re great for parties because they’re so versatile and can be made in big batches. Some people love these Korean pancakes with seafood, or simply with just the scallions alone. Mix it up and make them how you like them. 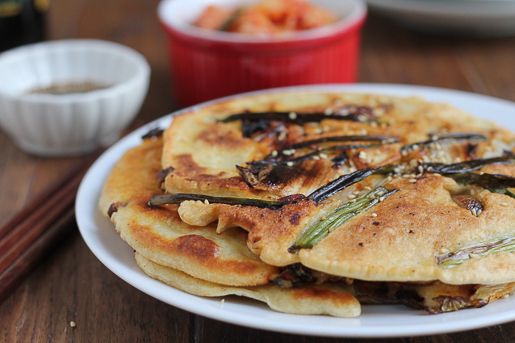 You obviously must have the right pan when making these Korean pancakes. 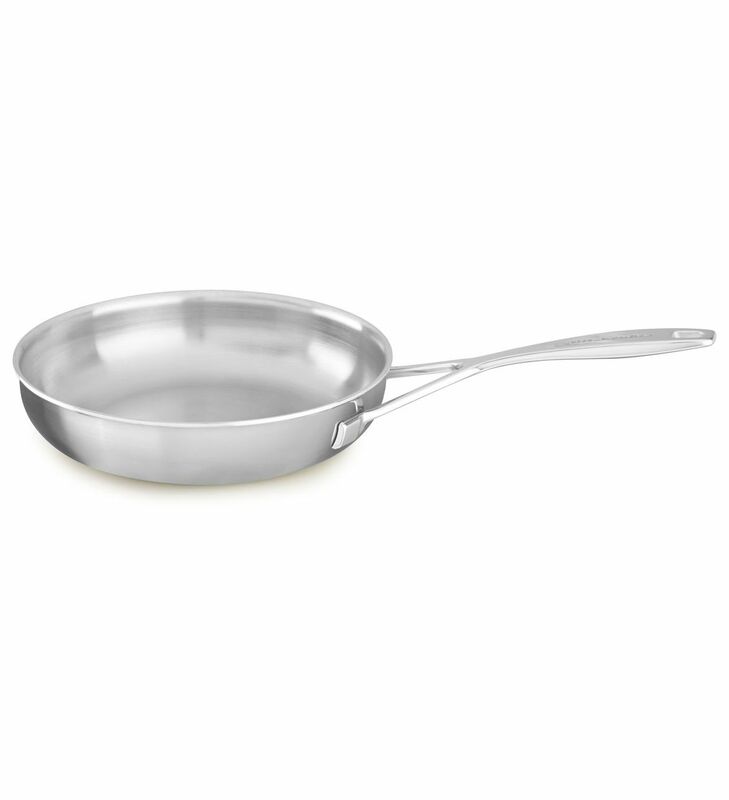 I used my trusty KitchenAid® 7-Ply Stainless Steel with Copper Core 10″ Skillet. This is my absolute favorite skillet and I use it all the time. The low, gently angled sides not only make flipping easier, but also provide a larger surface area for quickly cooking, sautéing, and searing. From rim to rim, the multi-layered design ensures that every millimeter of cooking surface provides optimal heat distribution for great cooking results, every time. And for me, the 10” skillet is just the perfect size, not too large and not too small. It’s perfect for my Korean Kimchi Scallion Pancakes! I also love serving Korean Kimbap! This is like Korean sushi, or Korean rice rolls with veggies. Everyone always asks me to make these and once you have prepped all of the ingredients, the rolling and cutting is actually really easy. If these seem like too much work, invite a few girlfriends over early and have them help you! Last up, are my crowd pleasing Bulgogi Sliders! 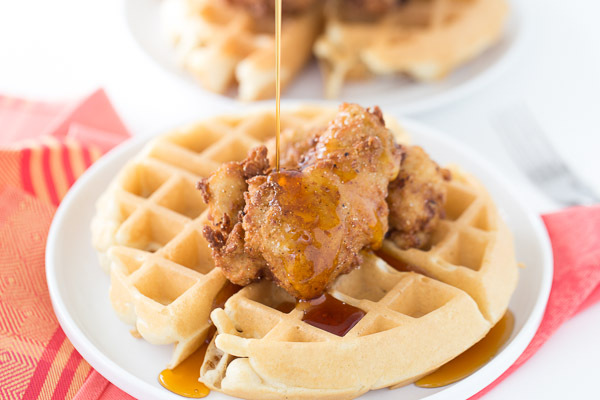 These seriously get devoured almost as soon as the platter hits the table. People love these for the delicious bulgogi (Korean marinated beef) and the easy-to-eat size. I love serving them this way when entertaining, because they are easier to eat and a little goes a long way! Using a large mixing bowl, combine and whisk together the flour, very cold ice water and salt. Add the eggs, one at a time, and whisk until combined. Using your KitchenAid® 7-Ply Stainless Steel with Copper Core 10″ Skillet over medium high heat, add about 1 to 2 teaspoons of vegetable oil and top with some scallions, kimchi and a few mushrooms (as shown above). Feel free to arrange the veggies in the pan or simply throw them in. Slowly pour in a thin layer of the pancake batter over the veggies into the pan. Let cook for about 3 to 4 minutes, or until nicely browned. Gently and carefully flip the pancake and cook the other side for about 2 minutes, or until cooked through. Remove from the pan and place on a clean plate. Repeat steps to make the remaining pancakes. When ready to cut, transfer to a cutting board. Slice into wedges, serve and enjoy with soy sauce and roasted sesame seeds. There are many variations on the soy sauce dipping sauce for these scallion pancakes. You can also add a touch of brown rice vinegar to the soy sauce and enjoy.